Approx 10-inch long x 4-inch wide at widest part of handle, x 1-inch thick. 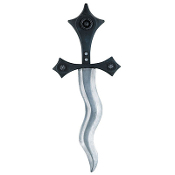 Wicked Dagger from Thy Wicked Court, features a wavy curved silver-painted blade and black medieval gothic-style silver-accented handle. Durable high quality hard plastic knife with mysterious looking crooked blade. Cool accent for any witch, wizard, sorceress, wench, knight or mad king, evil queen, spoiled prince or diva princess! Royalty from all of the majesty's court should all conceal such a cool device within their royal robes.